The handy printable highway map of Costa Rica includes a table of driving distances and an alphabetical index of grid coordinates for most cities and towns and features national parks, reserves and wildlife refuges. 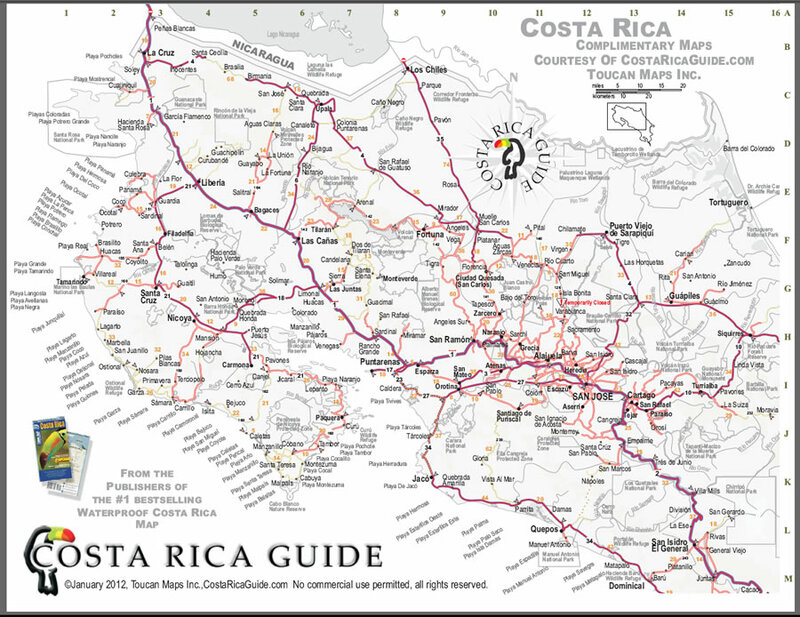 Nearly every trip around Costa Rica stays on page one of the map which includes the central Pacific coast from Dominical north to Manuel Antonio and Jacó, the beaches of the Nicoya Peninsula and Guanacaste including Playa Tamarindo. 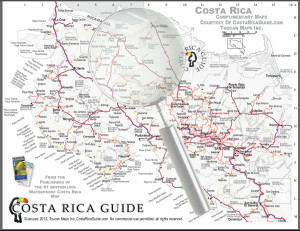 The northern Caribbean including Tortuguero plus popular inland destinations like Rincón de la Vieja, Tenorio and Celeste waterfall, Arenal volcano and La Fortuna, Monteverde cloud forest and the routes to them from SJO international airport near the capital and LIR international airport outside Liberia are on page one (above links go to free detailed printable maps of the indicated regions). 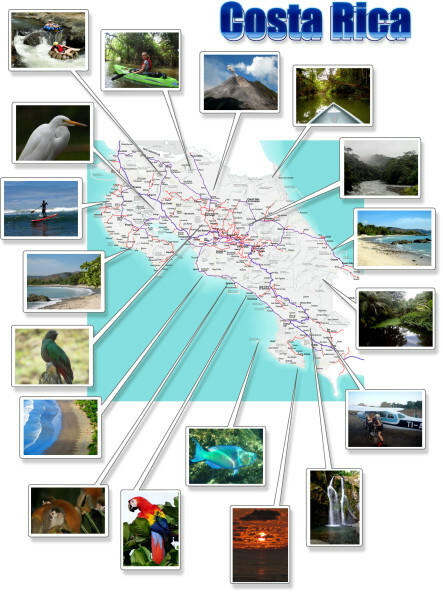 If you’re headed to Corcovado National Park on the Osa Peninsula or Puerto Viejo, Cocles, Cahuita, Manzanillo or the other beaches of the southern Caribbean you’ll also want to print out page two. The pdf download automatically includes both pages. The map can be stored on any portable device, i-pad, tablet or computer for use offline or when cell/3G/4G service is unavailable. 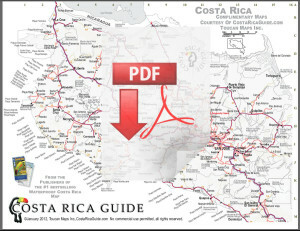 The maps are formatted to print at high resolution on standard 8.5 x 11 pages. Download for use on your phone or other device when cell signal or wi-fi are not available for live map feeds or print it out, scribble notes on it and keep it in your pocket. We do not sell advertising or charge lodges, restaurants, tours and other businesses a fee to be included on any map. If you’re looking for a real map instead of a page of coupons and marketing material this is it. Full color, 39″ x 26″ and includes all the downloadable maps plus several other detail maps* Shows national parks, wildlife refuges, beaches, drive distances and drive time calculator. It even includes a few handy Spanish translations for navigational phrases if you need to ask directions. Updated for 2015. 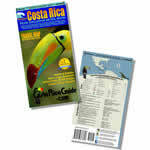 Costa Rica Guide, Toucan Maps Inc. provides these maps at no charge for personal use and without warranty. Commercial use prohibited without prior license – these maps may not be modified, sold, given away, or reproduced in any form including print or digital, or online copies for commercial purposes. If you would like to share this map please link to this page.